Citrus trees are not usually associated with our climate. But with protection and care, many citrus fruits can be grown in the UK. A polytunnel can be the perfect place to overwinter a range of different citrus trees to protect them from the winter weather. Here are some tips to help your overwintering citrus trees bear fruit and remain healthy over the coldest months. Watering is often where everything goes wrong when it comes to growing citrus trees in the UK. Summer brings warmer weather and citrus trees will require more water during this time. When winter comes, watering needs will reduce significantly. But the trees will still need to be watered. The best thing to do is to water heavily from the top of the containers in which citrus trees are planted, allowing all the excess water to drain away freely. You will then not need to water again until the top of the soil in the container begins to feel dry to the touch. While needs will differ for different citrus trees, most varieties and types will prefer to be kept at temperatures above 5 degrees C.
Exceptions to this are nearly hardy lemon trees, and Kaffir limes, which can tolerate temperatures down to zero or even minus 1 or 2. Hardy yuzus and finger limes will cope in temperatures down to around minus 15 degrees C. Some citrus trees may be kept in an unheated polytunnel in most of the UK, though some extra protection would likely be required by most UK gardeners. Pay particular attention to protecting the root ball from frosts. Citrus trees can experience extra stress in the winter in the UK, though if properly cared for, they will often fruit at this time of the year. 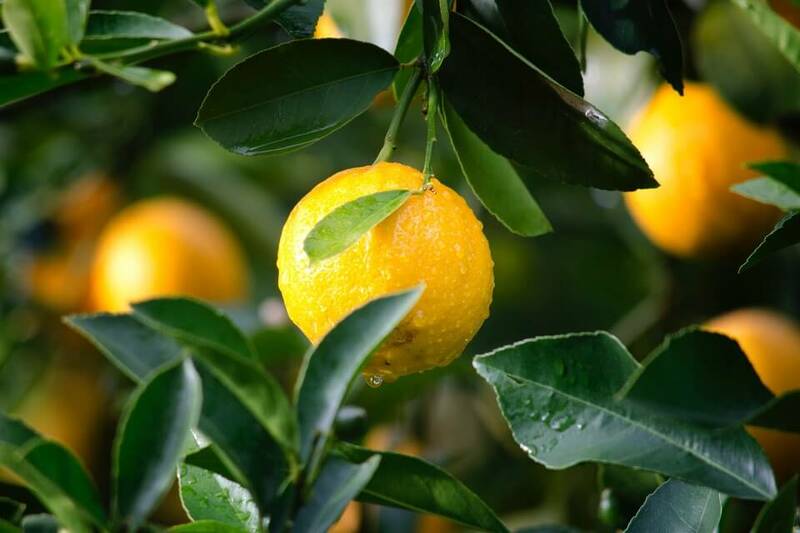 A winter feed that is rich in phosphorus and potassium rather than nitrogen will help encourage fruits to form and keep your citrus trees performing well. Low light levels is one of the biggest challenges for winter gardeners in the UK. While there is nothing that you can do about the short days and long nights, you should be sure to maximise what light there is in your polytunnel by keeping the plastic cover clean and clear of condensation. For some citrus trees, grow lights may be essential in order to keep trees in leaf and fruiting. Citrus trees are not deciduous and so lead drop is a sign that something is wrong. A few fallen leaves can give you a hint that something needs to change. Usually, watering is the issue – you may be watering too much or too little. Temperature and light levels are other things to look at if a citrus tree is losing its leaves. Check overwintering citrus trees regularly for signs of distress, and keep your eyes peeled for pest problems so you can nip these in the bud. Citrus trees will not always fruit predictably at a certain time in the UK, but usually you can expect ripe fruits in the winter months.